Upon our return to Edinburgh for an overnight stay, we solved many of the mysteries from our first visit. We stayed in a small guest house located across a couple diplomatic residences (for when foreign dignitaries visit). 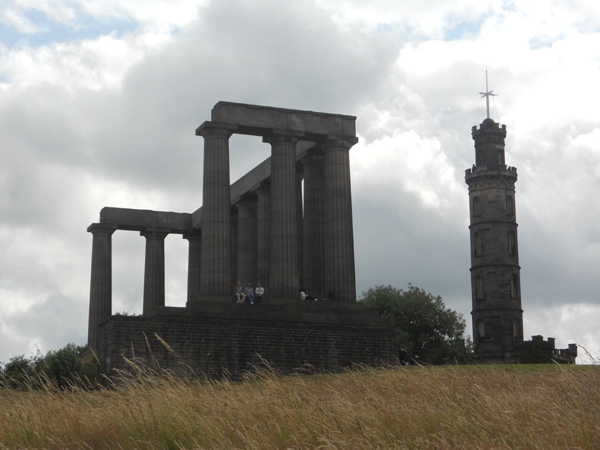 Our first stop was Calton Hill, and its many monuments we had glimpsed from afar. By that time, we’d spent most of the morning on a train and it was good to stretch our legs. The path leading up Calton hill, while steep, offers a fabulous view of the Firth of the Forth, as well as much of the city. We had already photographed many of Calton Hill’s monuments from below but, of course, they are much more impressive up close. 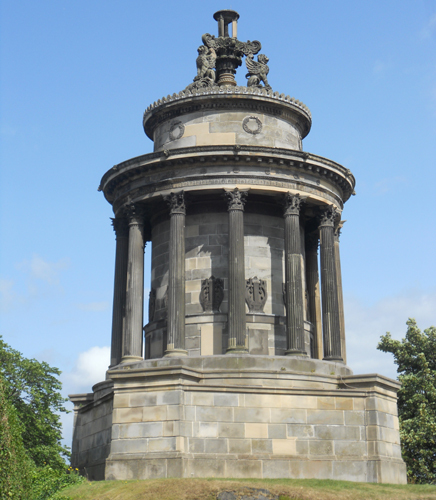 Up first was the National Monument, dedicated to soldiers who died during the Napoleonic wars (1803-1815). This monument was based on the Parthenon, and was one of the reasons Edinburgh gained the reputation “Athens of the North.” Unfortunately, it ran out of money in 1829, and was never finished. When we passed, several people had perched on the monument to eat their lunch. Next we visited the Nelson Monument, built in honour of the famous Admiral Nelson. This is a tower, the top of which used to contain a time ball which was dropped daily, allowing the ships in Leith Harbour to set their clocks. Inside is a small museum about Nelson’s life and the tactics he used at the famous battle of Trafalgar, where he died. You can pay one pound to ascend the stairs to the very top of the tower. I did not do this, but my husband did (and received a small poster with information about the Nelson Monument and its height that says ‘I climbed to the top of the Nelson Monument,’ which is actually pretty cool). From there we passed the art museum and the Burns monument and headed down the hill into the city. 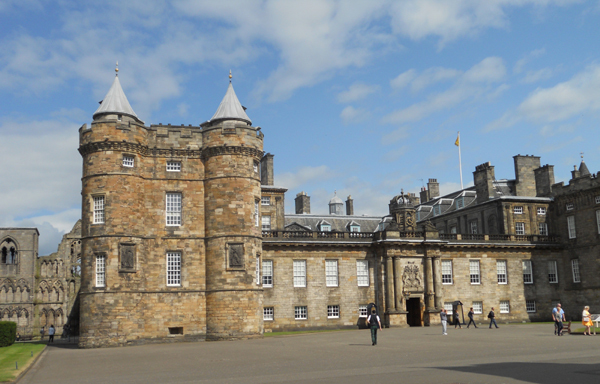 We past Holyrood Palace, which is the royal residence of the English Monarch in Scotland. We did not take a tour because it’s expensive, but the palace is pretty impressive from the outside. 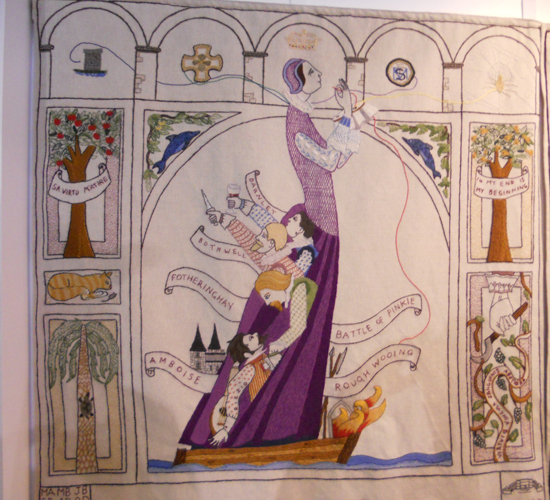 Instead, we popped over to the Scottish Parliament building to check out the Great Tapestry of Scotland, which they had on display. It was near closing when we arrived, so we didn’t have a lot of time, and the tapestry is huge. 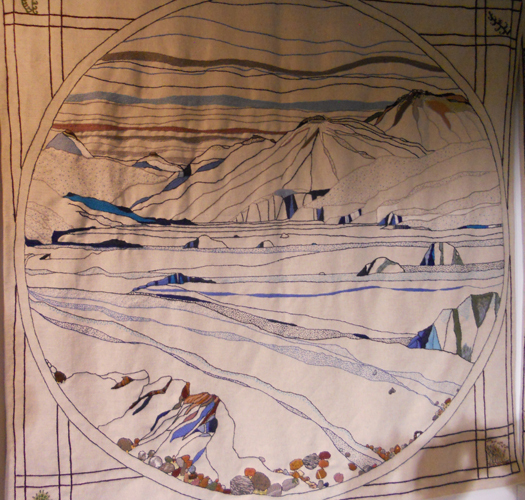 It is 143 metres (469 ft) long, each panel approximately 1 metre (3 ft 3 in) square and took around 500 hours to sew. 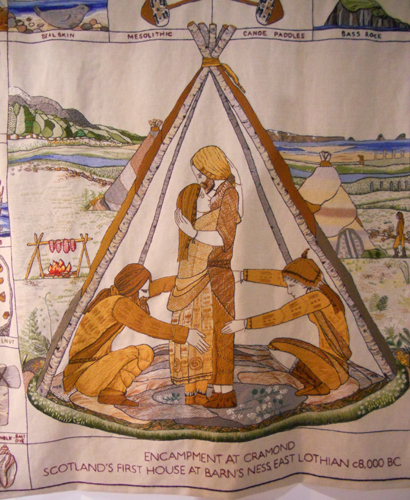 Each panel depicts details about Scotland’s history, starting in in 8,500 BC at the end of the last ice age. Every panel is gorgeous and clever in the way it depicts the history. There are both triumphs and obstacles, including Scotland’s long struggle with England. 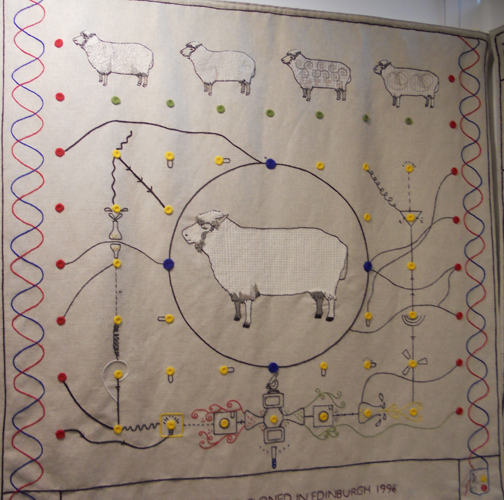 It moves right up through the modern day, depicting such events as the birth of Dolly the sheep in 1996, and the release of the Braveheart movie, which brought Scottish history and culture to film. Pictures were allowed and I took many. Part of me wishes I could have taken photos of every panel because they were all fantastic. 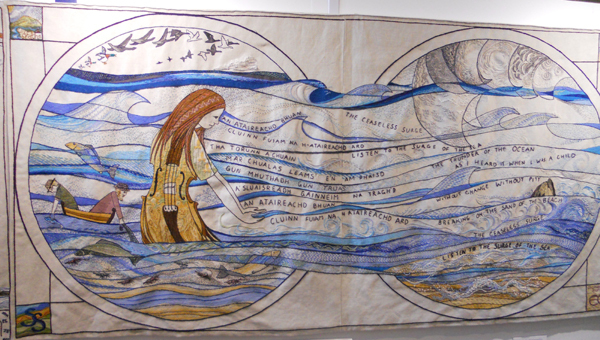 When we finished looking over the tapestry, we walked the Royal Mile, where people had begun to set up for the Fringe Festival. We only saw a few street performers before it began to rain, but it was enough to convince me the festival is quite a spectacle. Unfortunately, we were unable to stay for it as we had to return and start packing for our move to Canada.